John 20:24, 25 - But Thomas, one of the twelve, called Didymus, was not with them when Jesus came. The other disciples therefore said unto him, "We have seen the Lord." But he said unto them, "Except I shall see in His hands the print of the nails, and put my finger into the print of the nails, and put my hand into His side, I will not believe." The greatest marvels are always attended by incredulity, and any action which seems to exceed the measure of probability is ill-received by those who hear of it. But the sight of the eyes succeeds in banishing these doubts, and, as it were, compels a man by force to assent to the evidence before him. This was the state of mind of the wise Thomas, who did not readily accept the true testimony of the other disciples to our Savior's Resurrection, although, according to the Mosaic Law, in the mouth of two or three witnesses every word shall be established. I think, however, that it was not so much that the disciple discredited what was told him, but rather that he was distracted with the utmost grief, because he had not been thought worthy to see our Savior with his own eyes. For he, perhaps, thought that he would never receive that blessing. He knew that the Lord was by nature Life, and that He was able to escape death itself, and to destroy the power of corruption; for surely He Who released others from its trammels could deliver His own flesh. In his exceeding great joy he affected incredulity, and though he well-nigh leapt in his ecstasy of delight, he longed to see Him before his very sight, and to be perfectly satisfied that He had risen again to life according to His promise. For our Savior said: "Children, a little while and you will behold Me no more; and again a little while, and you shall see Me, and your heart shall rejoice." I think that the disciple's lack of faith was extremely opportune and well-timed, in order that, through the satisfaction of his mind, we also who come after him might be unshaken in our faith that the very body that hung upon the Cross and suffered death was quickened by the Father through the Son. Therefore, also, Paul says: "Because if you shall say with your mouth, Jesus is Lord, and shall believe in your heart that God raised Him from the dead, you shall be saved." For since it was not the nature of flesh itself which brought back life, but the deed was rather accomplished by the working of the ineffable nature of God, in which naturally abides a quickening power, the Father through the Son manifested His power upon the Temple of Christ's body; not as though the Word was powerless to raise His own body, but because the Father does whatsoever He does through the Son, for He is His Power, and whatsoever the Son brings to effect proceeds also of a surety from the Father. 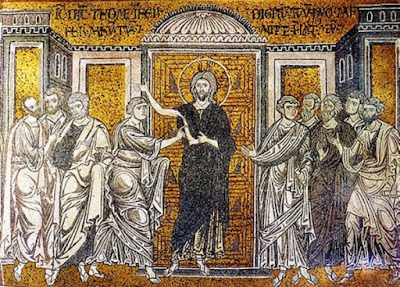 We, therefore, are taught, through the slight lack of faith shown by the blessed Thomas, that the mystery of the Resurrection is effected upon our earthly bodies, and in Christ as the First-fruits of the race; and that He was no phantom or ghost, fashioned in human shape, and simulating the features of humanity, nor yet, as others have foolishly surmised, a spiritual body that is compounded of a subtle and ethereal substance different from the flesh. For some attach this meaning to the expression "spiritual body." For since all our expectation and the significance of our irrefutable faith, after the confession of the Holy and Consubstantial Trinity, centers in the mystery concerning the flesh, the blessed Evangelist has very pertinently put this saying of Thomas side by side with the summary of what preceded. For observe that Thomas does not desire simply to see the Lord, but looks for the marks of the nails, that is, the wounds upon His body. For he affirmed that then, indeed, he would believe and agree with the rest that Christ had indeed risen again, and risen again in the flesh. For that which is dead may rightly be said to return to life, and the Resurrection surely was concerned with that which was subject unto death. John 20:26, 27 - And after eight days again His disciples were within, and Thomas with them. Jesus came, the doors being shut, and stood in the midst, and said, "Peace be unto you." Then said He to Thomas, "Reach out your finger, and see My Hands; and reach out your hand, and put it into My side, and be not faithless, but believing." Christ appeared once more unto His disciples miraculously by His Divine power. 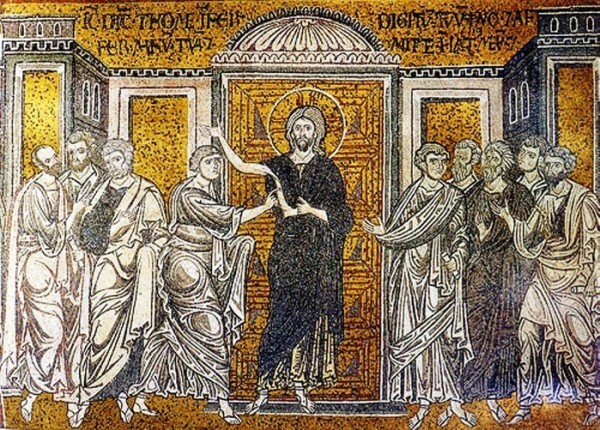 For He did not, like unto us, bid them open the doors for Him to enter in, but disdaining, as it were, the natural sequence of events, passed within the doors, and unexpectedly appeared in the middle of the room, presenting the same kind of miracle before the sight of the blessed Thomas as He had performed on the former occasion. For he that was most deficient in faith had need of healing medicine. He made use of the greeting so often on His lips, and solemnly gave them the blessed assurance of peace, as a pattern unto us, as we have said before. One may well be amazed at the minuteness of detail shown in this passage. For such was the extreme accuracy that the compiler of this book took pains to observe, that he is not content with simply saying that Christ manifested Himself to the holy disciples, but explains that it was after eight days, and that they were gathered together. For what else can their being all brought together in one house mean? We say this to point out the diligent care that the Apostle so admirably displays, and because Christ hereby has made clear unto us the occasion of our assembling, and gathering ourselves together on His account. For He visits, and in some sort dwells with, those assembled together for His sake, especially on the eighth day, that is, the Lord's day. Let us reckon it up, if you so please: On the one occasion He appeared unto the other disciples; on the other, He manifested Himself to them, when Thomas was also present. It is written in the preceding passage: "When therefore it was evening, on that day, the first day of the week, and when the doors were shut, He stood in the midst." Note, that it was on the first day of the week, that is, the Lord's day, when the disciples were gathered together, that He was seen of them, and that likewise also He appeared unto them on the eighth day following. And we must not, because he says eight days after, suppose that he means the ninth day, but that when he says this he includes the eighth day itself, on which He appeared, in the number given. With good reason, then, are we accustomed to have sacred meetings in churches on the eighth day. And, to adopt the language of allegory, as the idea necessarily demands, we indeed close the doors, but yet Christ visits us and appears unto us all, both invisibly and also visibly; invisibly as God, but also visibly in the Body. He suffers us to touch His holy Flesh, and gives us thereof. For through the grace of God we are admitted to partake of the blessed Eucharist, receiving Christ into our hands, to the intent that we may firmly believe that He did in truth raise up the Temple of His body. For that the partaking of the blessed Eucharist is a confession of the Resurrection of Christ is clearly proved by His own words, which He spake when He Himself performed the type of the mystery; for He brake bread, as it is written, and gave it to them, saying: "This is My Body, which is given for you unto remission of sins: this do in remembrance of Me." Participation, then, in the Divine Mysteries, in addition to filling us with Divine blessedness, is a true confession and memorial of Christ's dying and rising again for us and for our sake. Let us, therefore, after touching Christ's Body, shrink back from unbelief in Him as utter ruin, and rather be found well grounded in the full assurance of faith. Let the attentive reader call to mind that our Lord repulsed Mary Magdalene from touching Him, saying plainly: "Touch Me not, for I am not yet ascended unto the Father." Yet He allows Thomas to touch His side, and to feel with his fingers the print of the nails. We have already explained why our Lord did this, but none the less will we call back to mind the reason, briefly recapitulating what we said. For not yet had the time arrived for Mary to touch Him, because she had not yet been sanctified by the grace of the Holy Spirit; for while Christ was yet in our midst, and had not yet ascended to the Father in heaven, it was impossible to see the descent of the Comforter fully accomplished among men. It was meet, however, for Thomas to touch Him, as he, as well as the rest, had been enriched with the Spirit. For, as we said before, he was not on account of his absence without his share in the Spirit. For the munificence of the Giver reached unto him also, when the favor was granted to the entire company of the holy disciples. I think we ought also to investigate the following question. Thomas felt our Savior's side, and found the wounds made by the soldier's spear, and saw the print of the nails. Then how was it, someone may inquire, that the marks of corruption were apparent in an incorruptible body? For the abiding trace of the holes bored through the hands and side, and the marks of wounds and punctures made by steel, affords proof of physical corruption, though the true and incontrovertible fact that Christ's body was transformed into incorruption points to a necessary discarding of all the results of corruption, together with corruption itself. For will any man who is lame, at the Resurrection have a maimed foot or limb? And if any man have lost the sight of his eyes in this life, will he be raised again blind? How then, someone may say, can we have shaken off the yoke of corruption, if its results still remain and rule over our members? It is essential, I think, to inquire into this question; and this we say, with reference to the difficulties raised by the passage. We are as far as possible anxious to assent to the contention that at the time of the resurrection there will be no remnant of adventitious corruption left in us, but, as the wise Paul said concerning this body of ours, that which is sown in weakness is raised in power, and that which is sown in dishonor is raised in glory. And what can we expect the resurrection of this body in power and glory to be, if it does not imply that it will cast off all the weakness and dishonor of corruption and disease, and return to its original purity? For the human body was not made for death and corruption. But, inasmuch as Thomas required this proof for his perfect satisfaction, our Lord Jesus Christ, of necessity, therefore, in order to leave no excuse for our want of faith, appears even as he sought to see Him; for even when He ascended into heaven itself, and made known the meaning of the mystery concerning Himself to the rulers, principalities, and powers above, and to those who commanded the legions of angels, He appeared also unto them in this same guise that they might believe that in very truth the Word that was of the Father, and in the Father, became Man for our sake, and that they might know that such was His care for His creatures that He died for our salvation. And, in order to make the meaning of my explanation clearer to my hearers, I will add the very words spoken by the mouth of Isaiah on this subject. He says: "Who is this that comes from Edom, with dyed garments from Bosra?" They who raise this shout, I mean the cry: "Who is This That comes from Edom?" that is, from the earth, are angels and rational powers, for they are marveling at the Lord ascending into heaven. And, seeing Him almost, as it were, dyed in His own blood, they say unto Him, not yet apprehending the mystery: "Why is Your apparel red, and why are Your garments like him that treads in the wine-vats?" For they compare the color of the blood to new wine, lately trodden in the press. And what says Christ unto them? First, in order that He may be known to be the living God, He says: "I speak righteousness;" using the word speak, instead of "teach." And most assuredly. He that teaches righteousness must be a Lawgiver, and if a Lawgiver, surely also God. Then say the angels unto Him, as Christ shows them the marks of the nails: "What are these wounds in Your hands?" and the Lord answers: "Those with which I was wounded in the house of My beloved." For Israel was the house that the Lord loved, and Israel smote Him with nails and spear. For the outrages of the soldiers may justly be ascribed unto the Jews, for they brought the Lord to His death. Therefore, when He wished to satisfy the holy angels that He was, in fact, a Man, and that He had undergone the Cross for us, and that He was risen again to life from the dead, Christ was not content with mere words, but showed unto them the marks of His suffering. What is there to astonish us in the fact, that when He desired to rid the blessed Thomas of his unbelief He showed the print of the nails, appearing unto him, contrary to expectation, for the advantage of all men, and to the intent that we might believe without question that the mystery of the Resurrection was actually accomplished, no other body being raised but that which suffered death? John 20:28 - Thomas answered Him, and said unto Him, "My Lord and my God." He that had shortly before been slack in the duty of faith was now eager to profess it, and in a short time his fault was wholly cured. For after an interval of only eight days the hindrances to his faith were removed by Christ, Who showed unto him the print of the nails and His wounded side. But, perhaps, someone will ask the question: "Tell me why did the minds of the holy disciples carry out so rigid an inquiry, and so careful a scrutiny? For would not the sight of the Lord's body, the features of His face, and the measure of His stature, have sufficed to prove that He had indeed risen from the dead, and to secure His recognition?" What do we reply? The inspired disciples were not free from doubt, although they had seen the Lord. For they thought that He was not in very truth the same as He Who of old had lived and dwelt among them, and had hung upon the Cross, but rather that He was a spirit, cunningly fashioned like unto our Savior's image, and simulating the features of the form which they knew. For they fell into this delusion not without some apparent excuse, as He miraculously entered when the doors were closed; in spite of the fact that a body of coarse earthy mold requires a hole through which it can pass, and necessitates the aperture of the door to correspond in width with the size of the body. For this cause our Lord Jesus Christ, greatly to our profit, laid bare His side to Thomas, and exposed the wounds on His person, through his agency giving adequate proof to all. For though of Thomas alone is recorded the saying: "Except I shall put my hands and see the prints of the nails, and put my hand into His side, I will not believe," yet was the charge of lack of faith common to them all; and we shall find that the minds of the other disciples were not free from perplexity, though they said unto the holy Thomas: "We have seen the Lord." And that what we say does not err from the truth we may easily perceive by what the Divine Luke tells us: "As they spake these things, He stood in the midst of them," that is, of course, Christ, "and said unto them, 'Peace be unto you.' But they were terrified and frightened, and supposed that they beheld a spirit. And He said unto them, 'Why are you troubled? and wherefore do reasonings arise in your hearts? See My hands and My feet, that it is I Myself. Handle Me, and see; for a spirit does not have flesh and bones, as you behold Me having.' And when He had said this, He showed them His hands and His feet. And while they still disbelieved for joy, and wondered, He said unto them, 'Have you here anything to eat? And they gave Him a piece of a broiled fish, and a honeycomb. And He took it, and did eat before them." You see how the thought of unbelief is found lurking, not in the blessed Thomas alone, but that the minds of the other disciples were afflicted with a kindred disease. For, lo and behold! seeing that their faith wavered even after the sight of the wounds upon the Cross, He thought it right to convince them by another act, in nowise suited to a spirit, but specially appropriate to earthly bodies and the nature of flesh. For He ate the fish that was brought unto Him, or the portion of one. For when no mark at all of corruption any longer remained after the Resurrection of His holy flesh, because He lived again to incorruption, and when it was incredible that His body stood in need of food as heretofore, He yet showed unto them the print of the nails, and did not refuse to partake of food, in order that He might establish the great mystery of the Resurrection, and cause faith in it to spring up in the souls of us all. He does acts wholly alien to the nature of spirits. For how, and in what way, could the prints of nails, and the traces of wounds, and participation in bodily food, be found to exist in a naked spirit unconnected with flesh, to which all these things are suitable by the law of its being and the conditions under which it exists? In order, then, that none might think that Christ rose again a mere spirit, or an impalpable body, shadowy and ethereal, to which some give the name of spiritual, but that the selfsame body that was sown in corruption, as Paul says, might be believed to have risen again, He openly did acts suitable to a palpable human form. What we said at first, however, namely, that the blessed disciple did not so much lack faith owing to infirmity of judgment, but rather was affected in this way by excess of joy, will not be wide of the mark. For we have heard the saying of the blessed Luke concerning all the others: "And while they disbelieved for joy and wondered." It was wonder, therefore, that made the disciples slow to be convinced. But as henceforward there was no excuse for unbelief, as they saw with their own eyes, the blessed Thomas accordingly unflinchingly confessed his faith in Him, saying: "My Lord and my God." For we must all confess that it follows of a surety that He that is Lord by nature and Ruler over all is also God, just as also universal dominion and the glory of sovereignty is clearly seen to appertain to the living God. Observe, too, that when he says "My Lord and my God," he uses the article to show that there was One Lord and One God. For he does not say without the qualification of the article, "My Lord and my God," to prevent any one from imagining that he called Him Lord or God as he might have done one of ourselves or of the holy angels. For there are gods many and lords many, in this sense, in heaven and on earth, as the wise Paul has taught us; but rather he recognizes Him as, in a special sense, the One Lord and God, as begotten of the Father, Who is by nature Lord and God, when he says, "My Lord and my God;" and, what is a still greater indication of the truth, the Savior heard His disciple saying this, and saw that he rested in the firm conviction that He was, in fact, the Lord and God, and thought it not right to rebuke him. Christ, then, approved his faith, and with justice. And you may easily see that what I say is true. For to him that was possessed of this faith He says, at the end of the Gospel, as unto the rest: "Go and make disciples of all the nations." And if He bids him who was thus minded teach all nations, and appointed him to instruct the world in His mysteries, He wishes us to have a like faith. For He is, in fact, Lord and God by nature, even when Incarnate Man. For observe that the disciple, when he had touched His hands, and feet, and side, made unto Him this confession of faith, not severing Emmanuel into a duality of Sons, but recognizing Him as one and the same in the flesh, for Jesus Christ is One Lord, according to the Scripture. John 20:29 - Jesus saith unto him, "Because you have seen Me, you have believed. Blessed are they that have not seen and yet have believed." This saying of the Savior is very pertinent and we may derive the greatest profit therefrom. For hereby He showed His great care for our souls; for He is good, and wills that all men should be saved and come to the knowledge of the truth, according to the Scripture. What is here said may not unlikely excite surprise. It was, indeed, necessary for Him to be long-suffering, as was His wont, with Thomas, who uttered that saying, and also with the other disciples with him, who thought that He was a spirit or apparition; and also to exhibit, as He very readily did for universal satisfaction, the print of the nails and His pierced side; and also, contrary to use and need, to partake of food, that no plea for their unbelief might be left to those who sought to gain the benefits of His death. But it was also essential to have regard to the security of our faith. It was necessary also to have another end in view, namely, that those who should come at the last times should not easily be drawn into unbelief. For it was likely that some should err from the straight path, and from ignorance, practicing a spurious kind of caution, refuse to accept the resurrection of the dead, and put themselves forward, and say unto us, like that unbelieving disciple: "Except I shall see in His hands the print of the nails, and put my hand into His side, I will not believe." What sufficient means of satisfying them would there have been, Christ being no longer on earth but having ascended into heaven? And would they not have been, at times, thought to be justified in thus speaking, when they appeared to be imitating therein the disciple of the Savior, and, considering it a noble thing not to believe off-hand, but rather to require more for their complete assurance, claimed for themselves the sight that was shown to the holy disciples? Christ, therefore, restrains men from such an inclination, and keeps them from falling. For being truly God, He knew well the malicious designs of the devil and his practice to deceive. And, therefore, He declares that blessed are they who believe without seeing, for they are surely worthy of admiration. And why? Because unquestioning belief is due to what lies before our eyes, for there is nothing at all to raise doubt in us. But if a man accept what he has not seen, and believe that to be true which the words of his instructor in mysteries have brought to his ears, then he honors with praiseworthy faith Him that is preached. Blessed, therefore, shall be the lot of every man that believes through the voice of the holy Apostles, which were eye-witnesses of Christ's actions, and ministers of the Word, as Luke says. To them must we hearken if we are enamored of life eternal, and cherish in our hearts the desire to abide in the mansions above. John 20:30, 31 - Many other signs therefore did Jesus in the presence of His disciples, which are not written in this book, but these are written, that you may believe that Jesus is the Christ, the Son of God; and that believing, you may have eternal life in His name. He sums up the book in a manner, and makes plain to His hearers the object of the preaching of the Gospel. For, he says, this book was composed that you may believe, and believing might have eternal life. He says that the signs were many, and does not limit the actions and marvelous works of our Savior to those which were accurately known by him personally, and recorded by him, and leaves the other disciples to publish, if they chose, whatever was vividly impressed on their memory. For all the signs, he says, are not written in this book, but those only have been inserted by me which I thought best able to convince my hearers that Jesus is the Christ, the Son of God. This is what the inspired Evangelist says; and I think, too, that it may be of use to make the following observation: For if the whole meaning of the record is directed to producing in us this faith, and is well calculated to make us steadfast in the conviction that the Child of the Holy Virgin, Who was called Jesus by the voice of the angel, is the very Christ Whose coming was proclaimed by Holy Scripture; and if He be, indeed, very Christ and none other -- not merely a son but the Son of God in a unique and special sense; what then, I ask, can they who, through ignorance, are in doubt about the faith, and who, furthermore, strive to teach others to believe that there are two Christs -- what can they do or say in their defense, and what will be the sentence passed upon them when the great day shall come? For they divide Christ into two separate Beings, Man and God the Word, even after His union with man, and His ineffable and wholly incomprehensible Incarnation. Therefore are they in error, and have wandered far astray from the truth, and denied the Master that bought them. For if we examine into the definition of the being of Christ, and form a conception of Him, we find that the flesh is different from God the Word, Which is in the Father, and proceeds from Him; but if we consider the meaning of the Incarnation, and strive to fathom so far as we are able this exceeding great mystery, we conceive of the Word as One with His own flesh, though not converted into flesh. God forbid that we should so say, for the nature of the Word is inconvertible and unchangeable, and admits of no shadow of turning. Rather do we maintain, according to our holy and inspired Scriptures, that the Messiah, conceived of as attaining to the perfect definition of manhood through the Temple of flesh that enshrined His Godhead, is One only -- Jesus, the Christ and the Son of God. Consider that the selfsame truth is found to have existence in the nature of ourselves who are men. For we are combined into one man composed of soul and body; the body and the soul that it contains being distinct, but nevertheless coinciding to form one perfect animal, and wholly incapable of separation after combination with each other.